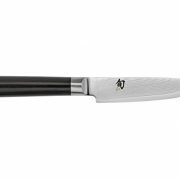 The Shun Classic Limited Edition 4-inch “Try Me” Paring Knife is ideal for any paring task, including chopping and mincing small foods and herbs. The extra length of this knife makes it easy to peel and trim even larger fruits and vegetables. 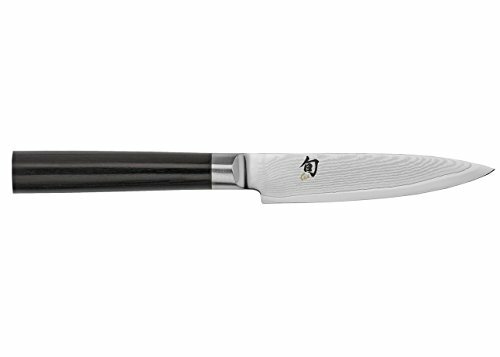 Made with solid core of proprietary VG-MAX steel and clad with 34 layers each side (68 total) stainless Damascus, the Shun Classic 4-inch Try Me Paring Knife features an ultra-sharp 16 degree cutting angle on each side. You will appreciate how quickly this knife can work through food prep. The ebony D-Shape PakkaWood handles have that sleek, sophisticated look that makes these knives feel more like art, than instrument, and are specifically designed for premium applications. The specially shaped handles rest perfectly in the curve of the fingers, for a more secure grip while handles remain moisture resistant. The bolster is ground out more on the right side for proper finger placement, as well as balancing the knives perfectly. 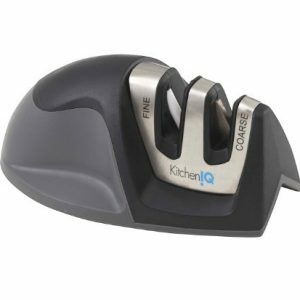 Precision blades and handle engineering mean long-lasting use and comfort-no matter how large or small you kitchen prep may be. Crafted in Seki City Japan, our Shun Classics are forged in the tradition of samurai sword making. These heirloom quality knives will be a prized treasure you’ll want to pass down to family for generations.